The vestige of American slavery had long gone politely ignored amid the polished Oxonian interiors of the rarefied university. According to the broken-windows theory of social disorder, it takes just one shattered pane of glass to unleash a cascade of chaos in a neighborhood. The authorities might fear this, but for others, a little chaos can occasionally be liberating. 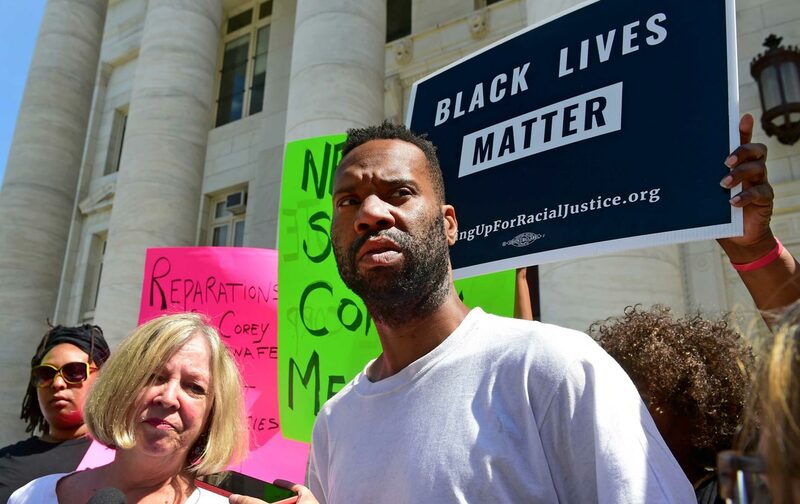 Such an occasion arrived for Corey Menafee one morning in June on the Yale University campus, when the custodial worker drove a broomstick through a small stained-glass window that depicted an eerily bucolic scene of enslaved blacks carrying bales of cotton. After the glass came tumbling down, Menafee heard his manager yelling about destroying university property. Then came charges of reckless endangerment and first-degree felony “criminal mischief”—and he had to resign from the job he’d held for eight years. The window smashing resonated with the nationwide wave of revolt in response to police brutality and racism, including a recent protest for Black Lives Matter on the New Haven Green, just down the street from Calhoun College, controversially named after the infamous advocate for slavery John C. Calhoun. The 38-year-old New Haven native is gobsmacked by his new fame. Before Yale he had done stints in retail and substitute teaching. The most activism he had ever undertaken, he says, was a side job during college, passing out campaign material—he doesn’t remember for which candidate. Though he did not see the window smashing as a form of activism per se, at the time, Menafee was aware of the controversies surrounding Yale’s racial history as well, including campus-wide protests over the name of Calhoun College and other visual emblems of black oppression. And he grew up experiencing firsthand the structural impacts of this history on New Haven, which has the fastest-growing income gap of any city nationwide, along with deeply impoverished black enclaves overshadowed by a real-estate empire fueled by Yale’s $26 billion endowment. But the window came into sharp focus about a week and a half prior to the incident, he recalls, when a young alumnus, visiting the campus for Reunion Week with his daughter, pointed out the window and how it had bothered him to see it as a student.